"ElasticFX is soon to come out. It's basically a 4 channels effect machine with lots of different effects of different categories (Modulation, Pitch, Distortion, Filter, Delay, Reverb, Others). The special twist of EFX is that there are different routing options how you connect 4 different effect slots AND similar to Elastic Drums, you can automate your tweaks of the effect parameters. Automation can get synced with other apps via Ableton Link and IAA sync then. 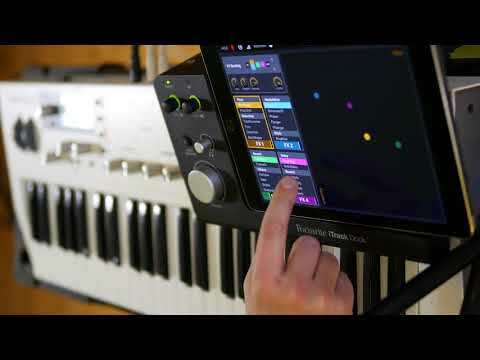 Elastic FX runs standalone (like in this video), or you can play it with other apps via Audiobus or InterApp-Audio (AUv3 is not supported)." Kaoss Pad on steroids. I'm in. Amazing. i’m still uncovering parts of Elastic Drums a full year later. I wonder how long it takes for all the devs to realize that AU is not just a nice bonus to have, but a must for a good app. Full screen AU is out. Why release an app that doesent support it when its the thing that defines a proper app? No AU (for this type of app) = no real interest. Gonna join the choir and say that I was baffled by the non-AUness of this app. Well. I'm skipping. No au means no buy for me nowadays. Specially for effects. Thanks for posting. But not relevant for my as not AU. I was thinking there was no automation until it kicked in at the end. AU not a massive issue for me, as I doubt I’d be able to run more than one instance on my Air2 anyway. However that would give it an edge over its most obvious competition - Turnado. This is basically the FX guts of ElasticDrums lifted out as a standalone. Which is actually fine as far as I’m concerned, as it’s one of the main attractions of ED for me. What’s not fine is the instability of ED, regular bugs, and CPU hit...so I hope this is slimmer, more reliable fare. If it’s cheap enough and bug free then I’ll probably buy this though, for the pitch shifter alone, but I’m wary of CPU hitters. Nice to see the Apple dock pop up in the vid, when the geezer was trying to use the app. Not just me then. No AU, no problem! Great stuff developer. I can see this replacing my now aged and buggy LiveFX app. Peeps, instead of fixating on AU you should also consider the developers support. Elastic Drums must be one of those apps that get updated and developed all the time! Features added at a daily rate, no kidding. I bet if you clean your spectacles and look beyond AU you might discover that by supporting the developer by buying the app you actually might further your cause and end up with AU support anyway. Win win I say. Disclaimer: I’m not guaranteeing for this app to ever become an AU but I guarantee it’s definitely worth the risk. Yesss, the automation would have been my first request way before AU support. I’d rathe have 3 different cool effects to have variety rather that several instances of the same app. I kinda expected it to have automation seems it has Elastic Drums heritage. Now we have Turnado, Live FX, Wow, Effectrix, FluxFx....enough stuff to bring any iPad to its knees. I’m a big fan of Turnado but it is tiddly, the clearer UI of this will be very welcome. Unless it’s silly money I doubt I’ll resist. I got used to it. TBH I normally spend an hour or two fiddling with it, find what I want (or not) and use the preset for months. We’ve been good friends Turnado and I but since it is not AU (likely a good thing) I welcome other effect apps to the palette of colours. FingerLab’s DFX came close but wasn’t quite IT. Oh cool. We are AU lover shaming now. I love going in and fiddling with the Turnado edit section - insane amount of depth in there, hadn’t thought of saving presets, but I’m more of a live twiddler. I’ve got DFX too, but Turnado’s the thing. Look forward to seeing more of this one, I’m a bit of a sucker for multi-fx apps. My first thought is to empathise with the dev checking this thread and instead of excitement finding a bunch of disillusioned AU aficionados bemoaning the lack of it. If you observe Christmas trads I hope you all get grey socks for your prezzies. Yeah, I have no problem with it not being AU. Would be great but not a deal-breaker for me. Agree. There is a lot to mess with in Turnado. Just a major OT gripe: The edit section is undersized in Tornado for no apparent reason. It makes me irrationally irritated that "Zoom" doesn't zoom the whole edit window! The automation and editing capabilities on this new app will probably make or break whether Turnado gets opened anymore. True. I'm personally a sucker for a specific pasty bit crush that I love in LiveFX that I cannot quite dial with turnado. I have to take elastic drums fx for a spin to get a flavour of what's coming. Have you checked the Zooming options in settings? Elastic FX is iPad only. I think elastic FX is better than Turnado. Been beta testing it and it runs pretty smooth, cpu wise it pushes the cpu up by about 15 to 20 % inside AUM according to the meter. Depends on the iPad model. That’s not bad, should be alright then on my old Air 2. Doesn’t it strike anyone as weird that a developer releases an Audiobus app and it’s discussed on an Audiobus forum and the unanimous reply from everyone is they want it to be compatible with a protocol that renders Audiobus unnecessary? The way people talk about AU is like its some kind of religious Puritanism. Get off your pedestals about it. People aren’t requesting AU so the can use it in Audiobus. They’re requesting it so they can use it in AUM or Auria or BM3 etc.without Audiobus.